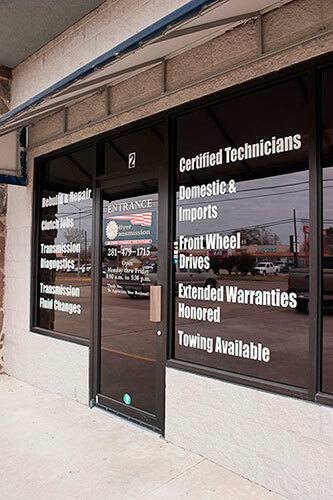 Hellyer Transmission & Automotive is your locally owned Deer Park, TX Auto Repair Shop. Hellyer repairs foreign and domestic cars, light and medium duty trucks. Hellyer Transmission & Automotive has the tools and experience to do the job right. We repair water pumps, fuel pumps, timing belts, shocks, struts and more. We service air conditioning systems in domestic and import cars and trucks. Need a clutch job, clutch repaired? Need an exhaust system repaired? Or Need an Oil and Filter change? Or perhaps a Transmission fluid change? We have local towing available. See our Auto Repair Specials for Discounts on services. Contact Hellyer for an Auto Repair Service Appointment. Pasadena, La Porte, South Houston, Pearland, Friendswood, Webster, League City, Seabrook, and Kemah Texas.